France's police and gendarmerie are completing preparations for an 11th wave of demonstrations, which the "yellow vests" protest movement outlined on Saturday. Unlike in previous times, law enforcement agencies have not yet announced the number of troops that they plan to mobilise to ensure the safety of citizens. Over 2,000 people have been arrested since the protests began and at least 10 have died. French law enforcement detained a total of 52 protesters during Yellow Vests demonstrations in the French capital as of 6 pm local time on Saturday, BFMTV reported citing police. Yellow Vests protesters decided to relocate from the Place de la Bastille as they started to move towards the Place de la République, where a night demonstration is expected to take place, BFMTV reported. At present, hundreds of demonstrators have already reached Place de la République. Yellow Vests demonstrations escalated on Saturday, with protesters gathering at the Place de la Bastille in Paris, as French police used tear gas and water canons to disperse rioters, a Sputnik correspondent reported from the scene, adding that there was a barricade on fire as well. A group of Yellow Vests rioters broke inside a police building in Evreux, the BFMTV reported on Saturday. According to media reports, the protesters managed to enter the edifice at 12:35 pm local time, however, in an hour, police managed to force them out of the facility. Meanwhile, it was reported that rioters set four cars that were left at a parking lot close to the municipal administration on fire. French law enforcement officers detained 15 protesters during Yellow Vests demonstration in Paris, the local BFM broadcaster reported citing a police source. Hundreds of protesters have gathered in front of the European Parliament in Strasbourg before beginning their march towards the city centre, the Le Figaro newspaper reported. Other French cities, including Rouen, Cannes, Bordeaux, and Nantes, are also witnessing renewed Yellow Vests protests on Saturday. — Sophie Bardin (@SophieBrdn) 26 января 2019 г. 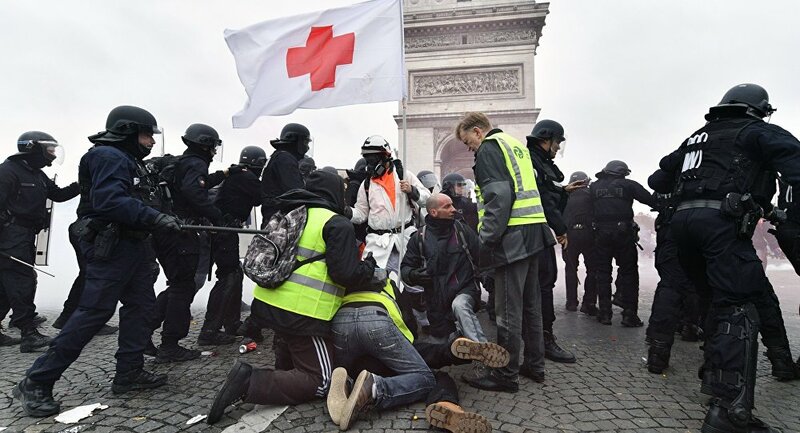 Police deployed armoured vehicles at the Charles de Gaulle square on Saturday as protesters started to gather at the Champs Elysee in Paris. Prior to the demonstration, the French Interior Ministry didn't rule out the possibility of new clashes during protests. The "yellow vests" movement began in mid-November in response to the government's plan to raise fuel tax, with protests quickly turning violent.